After the installation process is done, it is your job to keep them looking their very best. Your hardwood floors are an important feature of your home. After the installation process is done, it is your job to keep them looking their very best. Hardwood floors are exceptionally easy to care for, as long as you follow a few simple rules! There’s a reason that every article you ever read about maintaining your hardwood floors always mentions something about removing shoes: it really works. There are so many things that can be tracked in on the bottoms of peoples’ shoes. Simply wiping them on a mat, no matter how thorough someone is, just isn’t enough. If you really want to protect your floors and keep them looking their best, institute a “no shoes” policy! One of the most important thing you can do for your hardwood floors is to keep the dust off of them. You wouldn’t think so, but dust and other tiny little particles of this or that can cause little scratches in the floor. Plus, dust and pet hair take away from the hardwood’s classic appearance. You simply need to swipe a dust mop over the hardwood to clean it up. Spraying with a dusting chemical may help to speed up this process. If you’re dusting and find that not everything is coming up, you may need to vacuum to grab the particulates that escaped the dust mop. 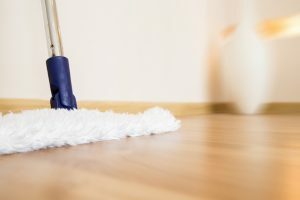 Excessive moisture can really damage your hardwood floors, but sometimes wet mopping is necessary. We don’t mean soaking wet, just get your mop damp with a hardwood floor cleaning solution and clean it. It is extremely important that you use the right cleaning solution for your hardwood floors. If you need guidance, your flooring installer will be happy to point you in the right direction. Using the right cleaner for your hardwood makes a world of difference. Harsh chemicals can damage the wood’s natural beauty. The right cleaner will make your floors shine. When you’re finished, you can turn on a fan to accelerate the drying process. This entry was posted on Tuesday, April 10th, 2018 at 6:35 pm. Both comments and pings are currently closed.